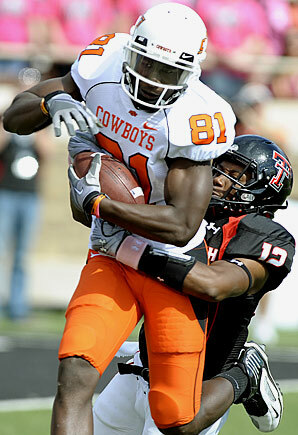 The 'Boys of Oklahoma State surprised many when unproven quarterback Brandon Weeden and wide receiver Justin Blackmon formed a lethal combo and beat up opponents. Both of the pair are back and ready for action. Though the Cowboys did suffer some losses. Back Kendall Hunter is gone and the defense lost five starters. Without Hunter the preferred running back will likely be Jeremy Smith. Sophomore Joseph Randle will also get snaps. 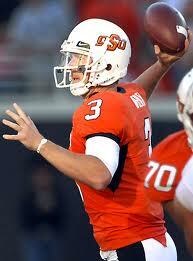 Blackmon is definitely Weeden's number one option but he has other guys to pass too. Junior Tracy Moore and senior Colton Chelf have a lot of talent. The offense line for the Cowboys is decent. Tackle Levy Adcock is the best protector on the team. Nick Martinez leads the other side and up the middle center Grant Garner are good. The defense lost players but still have six returning men. The defensive line took the biggest hit with just one big guy returning in Jamie Blatnick. Richetti Jones waits in the wings and will be ready anytime. Linebacker James Thomas is the best returning player at his position. The last line of defense has had talent over the years and has the same in 2011. Safety Markelle Martin is the best player in the secondary. Junior Brodrick Brown makes plays and safety Johnny Thomas shouldn't be overlooked either. Punter Quinn Sharp is exceptional.